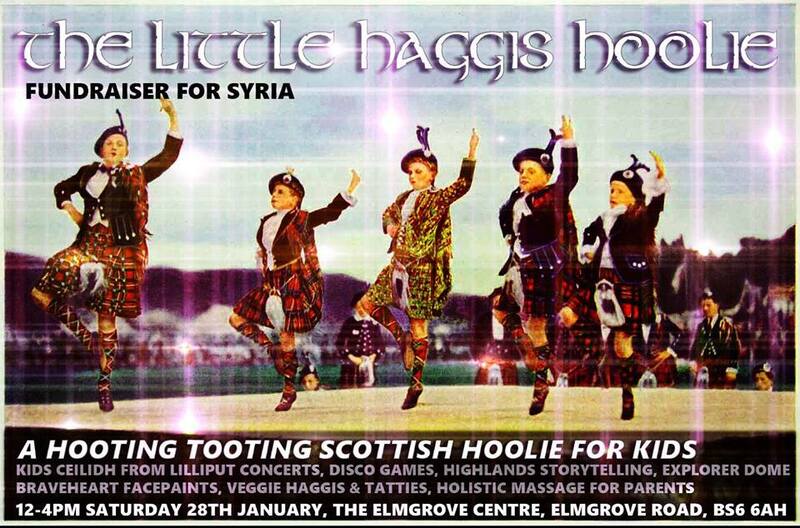 On Saturday 28th January there will be two fantastic fundraising events at The Elmgrove Centre in Cotham, each with a Scottish theme! The events are being organised by local mum, Jenna Brown from Lilliput Concerts and all money raised will be going towards the wonderful work of Medecine Sans Frontiers in Syria. There will be a daytime event especially for children and families from 12 – 4pm. There will then be an evening event from 6.30pm – 12am for adults. However, babes in arms and older children are welcome too if you can’t get a sitter but want to come for a bit (if under-16s are accompanied by someone with an adult ticket they can come come along for free). The line-up of activities at both events is fantastic! At both the daytime and evening events people will get fed a delicious Haggis banquet and there will be live music from Lilliput Concerts bands with a Ceilidh, plus pipers and singers, holistic massage and there will be lots of games and prizes to be won. At the evening event there will be a bar hosted by The Apple and at the children’s event there will be face painting, a craft table, Explorer Dome mobile planetarium shows and holistic massage for parents and carers! If you book both the day and evening events there will be a discount on ticket prices. An event especially for children and families with fun for all ages. Activities include a Haggis banquet, live music from Lilliput Concerts bands with a Ceilidh, pipers, lots of games and prizes to be won, craft table, face painting, Explorer Dome mobile planetarium shows and holistic massage for parents and carers. An event aimed at adults including a Haggis banquet, live music from Lilliput Concerts bands with a Ceilidh, pipers, singers, holistic massage, lots of games and prizes to be won plus a bar hosted by The Apple. Babes in arms and older children are welcome too if you can’t get a sitter!